On June 13, at Koza Athletic Park, "Eisa Dance Monument" includes an advertising display of a large photograph of an eisa performance by young people in Okinawa City. 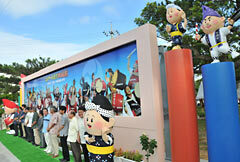 On June 13, the Okinawa Zento Eisa Festival Executive Committee held a ceremony to commemorate the completion of the “Eisa Dance Monument” in Koza Athletic Park, Okinawa City. This day marks six years since the Okinawa City declared itself as the “Town of Eisa dance.” The monument is third of its type following those that have been erected at the Raikamu Intersection and the Goya Crossroads. It costs about 4.5 million yen, which are donations from the residents’ associations and companies. The monument has an advertising display about four meters high and 14 meters wide, on which there is a large photograph of eisa performance by youth groups in the city. It also has four statues of Okinawa city’s image character of “Town of Eisa,” including Eibo, Sarchan and others, standing on either side. Dozens of people attended the ceremony, including municipal officials, members of the assembly and business people.